"Our mission now is to find 18 beautiful angels, as foretold in the Scriptures, to present to Lucifer. And one of them will be chosen to continue his work on Earth. Satan will no longer be beast, he will be beauty." Who ever said being a model was easy? 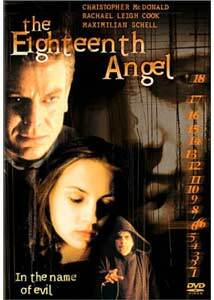 In The Eighteenth Angel, lovely aspiring teen model Lucy Stanton (Rachel Leigh Cook) is pegged by a group of crazy Etruscan priests as the perfect "angel" for their demented plan to allow Lucifer to return and rule on Earth. The robe-wearing Etruscans are led by the equally demented Father Simeon (Maximilian Schell), who was excommunicated by the Church for dabbling in radical genetic research. Simeon's plan for the "ultimate marriage between science and Satan" is a little hard to follow at times, but it is garnished in pseudo-religious babble in an attempt to soften the blurry factual edges. Lucy's father Hugh (Christopher McDonald) is, of course, the only one suspicious of the Etruscans, which probably has something to do with the fact that his wife took a suicidal plunge off a roof after interviewing Father Simeon. McDonald, who will always be Requiem for a Dream's Tappy Tibbons to me, has the unenviable task of creeping through graveyards, opening crypts and skulking around in dark monastery caverns on his quest to learn the truth. And boy, will he be sorry. The Eighteenth Angel was written by David Seltzer, the same chap who penned one of the premier return-of-Satan films, the 1976 classic The Omen. Sure, he's written plenty of other mainstream works (Dragonfly, Punchline, Bird on a Wire) but he will always be the guy responsible for bringing Damien to life. It's unfortunate that with this latest attempt, it seems that Seltzer is more content to vaguely recycle his past, rather than re-invent the genre. I suppose the genetics angle of this one could be looked at as a stab at modernizing the storyline, but the fact that it is sort of convoluted in its presentation severely waters down that element. Director William Bindley stages a handful of fine sequences, especially the unnerving scene where a character is dragged by the neck between two galloping horses, and overall The Eighteenth Angel looks quite good, though it is alarmingly goreless. There are eerie Italian monasteries, dark caverns and of course plenty of creepy thunder and lightning. But for a film so seeped in Lucifer, there are remarkably few (if any) genuinely scary moments that occur. We get evil cats, mutated rats and even a couple of random face peelings, but all of the spooky-sounding choir music in the world alone won't make a film frightening. Image Transfer Review: The 1.78:1 anamorphic widescreen transfer has a few spotty moments early on, but quickly settles in to be a respectable job; some of the scenes set in Italy look particularly sharp and well rendered, such as the big dragged-by-a-horse sequence. Colors tend to run deep and dark, with fleshtones waffling between a bit too golden and oddly pale, depending on the scene. Black levels are fine, and none of the film's required shadowy locales looked noticeably muddy. All in all, a decent transfer from Columbia TriStar on this one. Audio Transfer Review: The 2.0 Dolby Digital surround track has all of the thump and polish of a more sophisticated track, and it only goes to show that engaging audio isn't limited to DTS or 5.1. First of all, the track has a plenty of good old-fashioned, mood-enhancing rumble (thunder, doors slamming, etc. ), and the film's countdown clock reverbs with all manner of loud creaks and groans. Dialogue is clear, and there is a constant dose of subtle directional imaging across the front channels. Extras Review: Where the hell is my Rachel Leigh Cook photo gallery? Well, where is it? It sure isn't here, because all that Columbia TriStar has seen fit to include on The Eighteenth Angel is a pair of forgettable trailers (Vampires: Los Muertos, Urban Legends: The Final Cut), along with subtitles (English, French) and 28 chapter stops. All is not completely lost with the seen-it-before elements of The Eighteenth Angel, and it might make for a satisfactory rental for fans of The Omen-styled films, though there likely won't be any surprises or scares here. Rachel Leigh Cook is certainly easy on the eyes and befitting of being an angel, and director William Bindley does a by-the-numbers turn of a retread story into predictable, moderately passable horror.